Security cameras are nothing new and there is no clear platform that works best for all. That said, the wireless versions of these systems do seem to be the most popular. Up until a few years ago Wi-Fi cameras were less than ideal, but as Wi-Fi routers have become more powerful, providing better range and increased bandwidth, these cameras make sense for many people. The use of Wi-Fi means there are no wires to run, except for power, which makes the installation quick, cheap, and can be completed by anyone. Another benefit is that you can easily move them from place to place as needed. 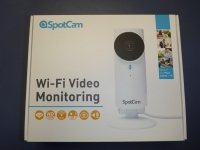 Today we are going to look at a relative newcomer to the Wi-Fi camera game, the SpotCam HD Wi-Fi wireless video monitoring camera. 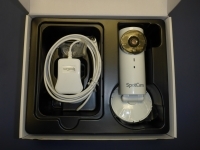 Started in 2013 SpotCam released their first Cloud enabled camera. Currently they have two cameras, one for indoor applications and one for outside (SpotCam HD Pro). The version we received for review is the indoor model and we will compare it to the well-established Dropcam HD. On paper the SpotCam HD appears to be very similar to the DropCam HD. Both allow for remote access to your camera's feed either through their proprietary mobile apps or via their website. Both use bank level SSL to encrypt your video stream and you can set both up to have smart alerts. Both also have night vision and two way communication. 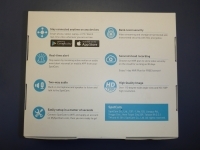 Below is a more detailed list of the specifications for the SpotCam HD. » Compatible with IE 7+, Firefox 3+, Safari 3+ and Chrome. From the box it is clear this is a cloud based Wi-Fi camera. So if you want to record the video locally this is not the product for you. Included in the box is a quick start guide, wall mount plate, power supply with 10' cord, and the SpotCam HD.